There were times when expressing the intention of being a pilot as a female sounded absolutely ridiculous; it was a practical joke and an indirect way of displaying confusion and uncertainty of the “feminine purpose”. There were also times when the thought of having a female pilot only lived in our imaginations. Gone are those days because today, Africa’s fly girls are gradually growing in numbers. The aviation sector is one of those that have experienced a striking twist in gender-acclaimed professions. Everybody seems to be doing every and anything they set their minds to, more so when they have a potential and outstanding skill to be great in that line of profession. Today, women are just as much adventurous as men are. In terms of profession, there is an evidence of a paradigm shift in the African traditional gender roles from core rigidity to a fairly liberal contemporary society. So, just like we celebrate women in politics and business, so also have the feminine power been evident in the field of technology and more specifically in engineering. No one is that surprised anymore to see female military women, power bike riders, mechanical engineers or even plumbers but when you say female pilot, especially African female pilots, it gives an interesting vibe. The reason for this is that Africa is finally taking a worthy chance on her women, giving them more room and opportunity to serve the nation. Women in aviation are respected because it is a big deal to know that the hundreds of lives suspending in the air lie in your hands. Typically, that is the role of the man in the African system – defending the lives of his own; however, the women in aviation have taken up this lot too and are incredibly successful at it. These amazing women in every sense of the word, are not scared of heights in any manner- practically or socially; they are confident women who have conquered major fears and living out their purpose in life with all pleasure. Saying it is a milestone to have a lot of African female pilots is just for the lack of words to express the depth and implication that this novel development creates for the present day society and posterity as well. Whoever knew Bessie Coleman will successfully make it as the pioneer of black women in the field of aviation; in the same way, these African ladies are making history in the aviation sector. Irene is the daughter of a pilot; she nursed the dream of flying at a tender age, worked towards it and finally got it. For 6 straight years, Irene worked as the only female pilot for Kenya Airways. 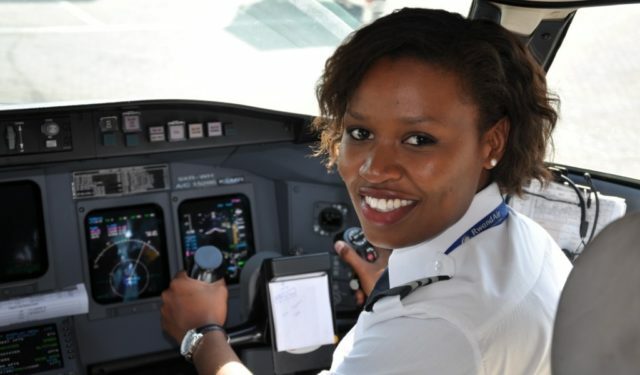 She is Kenya’s first female pilot to be endorsed as a captain of Boeing 787 Dreamliner aircraft. Rwanda is a nation that has more women in her nation’s parliament than in any other African country, thus, making more room for the women folk in the country. Esther is the first female pilot in Rwanda; lost her dad in an air crash, but still went ahead with her impassioned pursuit in the world of aviation. At the age of 24, Esther has become a certified private and commercial pilot. In relation to the country’s effort towards gender equality and the success of this bright and smart pilot, there is more hope for female pilots, as RwandAir, the national airline employs 2 more female pilots. Chinyere Kalu has always been an audacious personality. Despite the timing of choosing this stereotypical “manly” profession, she went on with her quest of being a pilot. Having an encouraging aunt was a plus to her daring nature. She has been conferred a Member of the Order of the Federal Republic of Nigeria, owing to her accomplishments in aviation. In October 2011, President Goodluck Jonathan appointed her the Rector and Chief Executive of the largest aviation training institute in Africa, College of Aviation Technology, though it lasted for a short while. Chinyere has displayed undoubted proficiency in the aviation sector and for a long time, she has been an aviation instructor. Asnath became a licensed pilot at the age of 23. She is the first black South African woman to fly a plane and the first black female trainee in South Africa. Born in Polokwane, Asnath was inspired to become a pilot by reading about aeronautics. In faith and perseverance, she made her dream come true. Today, she is the founder of the African College of Aviation. Her innate aviation skills have earned her several reputable accolades. Against all odds, Rachel finally got to wear the pilot regalia she once admired as a child. Not only that, she became the youngest to fly a commercial plane in Ghana. The Accountancy graduate has expressed her potential interest in humanitarian and charity works for the people; economics and international politics. Rachel is a professional who is utterly creative and has a flair for the arts and most importantly known for her resplendent resilience. Since Rwanda is ardent in the business of including more women in various sectors of the country, it is not hard to comprehend the official appointment of Chantal and Meron as the first ever female pilots to be part of the UN’s peacekeeping mission in South Sudan (UNMISS). What can we say, African ladies mean business; they are definitely not smiling. With unprecedented female successes like this, gender equality is a strongly budding feat in the African populace. The Nigerian twins based in Canada are the first female twin airline pilots in Nigeria. Both are senior aviation officers who work with Aero Contractors – an airline commended for having more female pilots in the system. The twin pilots already have a successful 7 years experience of being in the profession. Favorably, they attest to a zero gender discrimination all through their training and flying experiences. Chipo Matimba is one of the 6 female pilots in Zimbabwe; bravely, she ventured into military aviation and has done very well for herself. Her life and success in the profession have endeared a sense of focus and purpose on younger Zimbabwean generation to aspire towards greatness and make a better living for themselves and their society. Earlier I mentioned what a milestone it is to find women doing “manly” professions, well here is a young lady who has what it takes to be a soldier and a pilot at the same time, indeed a daunting combo. For the first time ever, Nigeria records a female martial pilot in the Airforce, fondly known as one of the “knights of the air”. Blessing is a Kaduna State indigene whose position has made a resounding history in the whole of West Africa. Aluel works for Ethiopian Airlines and for Fly Dubai. She is the first female South Sudanese commercial pilot, currently flying a Boeing 737. With her family, she left home and became a refugee in Kenya and later fled to the United States where she spent most of her life. As a teenager, she made attempts in the field of modelling and fashion but it didn’t seem to be her calling. Today she has added to the number of growing female pilots in Africa. Aluel traded her business management course for aeronautics but still has an active business sense. Imoleayo is also in the league of young female pilots who obtained their license as commercial pilots at the age of 23. She graduated from the Nigerian College of Aviation Technology, Kaduna; and emerged tops in her class. This brilliant Aero Contractors pilot is currently serving at the rank of First Officer. Despite her conspicuous proficiency, Imoleayo still updates her aviation knowledge and skills in reputable aviation institutions in the world from time to time.